Step 1. 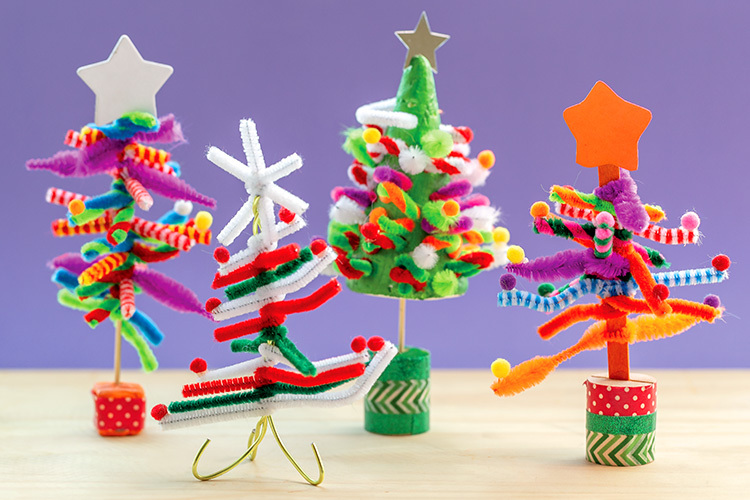 To create the tree branches, use five chenille stems and bumps. Cut each stem into four pieces (cut in half, then cut each piece in half again). Step 2. At the stem’s centre, tightly wrap and loop it around a satay stick. NB: you can also use a popstick, or craft wire. Step 3. Repeat this step with the remaining stem pieces, keeping branches close together. Step 4. Once in place, shape the tree. Cut the branches at the top shorter, and keep the lower ones longer. Step 5. Insert the satay stick (trunk) into a cube of plasticine (or a wooden model stand) and wrap base with washi tape. Step 6. Glue a sequin or cardboard star at the top of the tree with Supertac and decorate with pom poms. Extension: Festive poly cone Tree – see our website!